Gue Gim Wah is representative of a small minority of Chinese who found the offerings of Nevada attractive and, despite several opportunities to change her home, chose to remain in Nevada. She became a well-known restaurateur in rural Nevada and friend of President Hoover. Gue Gim was born in 1900 in Lin Lun Li, China. 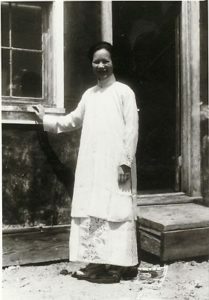 Her father, Ng Louie Der, owned a home and business in San Francisco and returned to China regularly as his funds would allow to visit his wife and family. Gue Gim’s mother passed away when she was only eight years old and her brother and his wife raised her. Her father remarried and in 1912 brought his family to San Francisco. Gue Gim’s time in San Francisco was mainly restricted to two activities, Chinese language school and church. Her father had joined the Methodist Episcopal Church and had Gue Gim and the rest of her family baptized. Four years after moving to the United States, Gue Gim was married to Tom Fook Wah. Her new husband owned a successful boarding house in Nevada and Gue Gim and her new husband settled in Prince, Nevada. At first, Gue Gim remained secluded in their home. After a mine owner learned of Gue Gim’s desire to learn English, he arranged for her to attend the Prince School. Gue Gim excelled at the school and passed through eight grades over the course of the next several years. In the late 1920s, the Wahs left Prince and went on an extended vacation to South China. Upon their return to Nevada, they settled in Caselton in 1929. Business was slow and for the first time, Gue Gim began working in the boarding house. Tom passed away from cancer in 1933 and Gue Gim took over operations of the boarding house on her own. Gue Gim expanded her business and worked both as a boarding house operator and restaurateur. During World War II, business grew rapidly and Gue Gim’s cooking became well-known. She became friendly with former President Hoover, who owned a portion of the mining operations. Production at the nearby mines slowed down during the 1950s, and Gue Gim’s business suffered. Her reputation remained, however, and in 1971 the Los Angeles Times ran an article about her restaurant. Gue Gim’s story made her the subject of several magazine articles, oral histories, and essays on the role of Asian immigrants in the American West. She passed way in 1988 in Prince, Nevada. Source: Sue Fawn Chung. “Gue Gim Wah: Pioneering Chinese American Woman of Nevada.” History and Humanities: Essays in Honor of Wilbur S. Shepperson. Francis X. Hartigan ed. (Reno and Las Vegas: University of Nevada Press, 1989), 45-79.